The metal bike frames that we’re used to consist of tubes, which are joined together via either welds or lugs. Many wooden frames, on the other hand, consist of two carved-out sides that are bonded together down the middle. 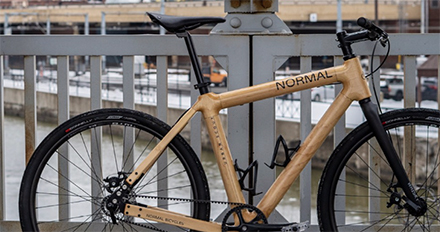 Normal Bicycles, based out of Buffalo, New York, splits the difference – its frames are made of wooden tubes. “It’s multiple layers of maple veneer, laminated together,” said designer/builder Chris Kudla, describing his tube-making process. It should be noted that there’s also a thin layer of carbon fibre lining the inside walls of the tubes. Those tubes are joined to one another using an aerospace-grade aluminium alloy and titanium fasteners. A marine finish is also applied, to keep the wood from being damaged by rain, snow or salt. As far as weight goes, the custom gravel bike that was being showcased at NAHBS weighs a claimed 10.2 kg. Chris and his wife/business partner Jessica also had one of their cheaper, production Urban Scout commuter bikes on display – it tips the scales at 11.3 kg. Pricing for the Scout ranges from US$3200 to $3550, depending on the package. The gravel bike, on the other hand, is worth around $6000.